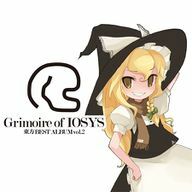 Grimoire of IOSYS – Touhou BEST ALBUM vol.2 (Grimoire of IOSYS – 東方 BEST ALBUM vol.2) is a doujin album by IOSYS released on 2012-02-29. A best of album featuring arrangements from previous releases. This page was last edited on 8 July 2017, at 15:03.